The Child Protection Network Foundation, Inc. (CPN) is a Filipino non-stock, non-profit charitable foundation registered with the Securities and Exchange Commission (SEC). CPN is a multidisciplinary network that is committed to the highest clinical standards of care for abused children. It works towards capacitating women and child protection specialists and women and child protection units (WCPUs) to achieve excellence in serving abused children and children-at-risk. It has grown from one child protection unit (CPU) at the Philippine General Hospital to 73 women and children protection facilities in hospitals and local government units spread across 9 cities and 40 provinces in the Philippines as of 2014. CPN’s goal is to establish at least one WCU in each of the 81 provinces of the country so that every abused woman and child will have access to services within 2 hours. From 2004 to 2014, the WCPUs have served more than 45,562 children. CPN is composed 1) individual members who have been trained to be women and child protection specialists and 2) WCPUs that are either hospital-based or community-based across the country. 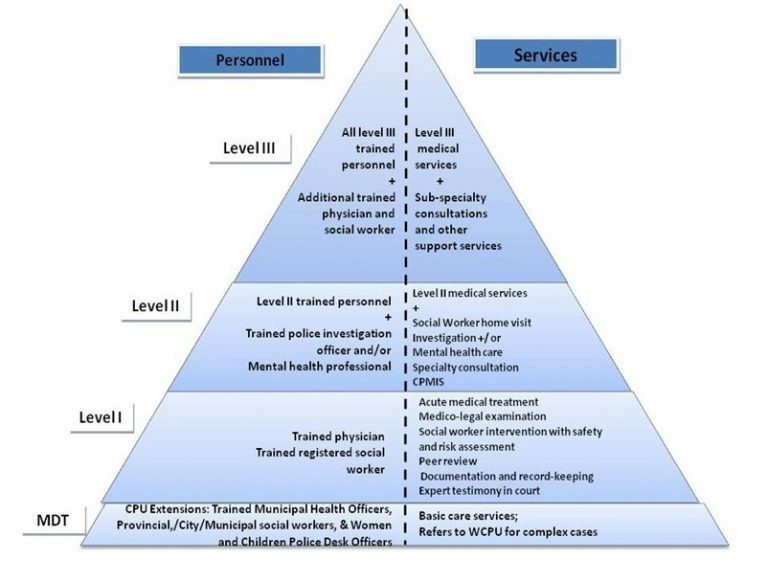 Figure 1 illustrates the levels of Women and Child Protection Unit as stated on the Department of Health’s Administrative Order No. 2013-0011: Revised Policy on the Establishment of Women and Child Protection Units in all Government Hospitals. The Multidisciplinary Team Training on Violence Against Women and Children (MDT on VAWC) is a four-day live-in, comprehensive, and interactive training program designed for physicians, social workers and police officers who are at the frontline of responding to VAWC cases (i.e., municipal health officers, municipal social workers, WCPD police officers and investigators. The training program aims to equip participants with the knowledge, skills and attitude necessary for handling VAWC cases through multidisciplinary, gender-sensitive and rights-based approach. The course has four learning outcomes: 1) effective communication skills; 2) competent gathering of evidence to establish abuse; 3) appropriate use of MDT; and 4) effective case management. The training objectives are aligned with CPN’s vision, mission and goals (Table 1) and cut across the medical, social service and legal professions (Table 2). The MDT on VAWC is run by multidisciplinary teams composed of individual members of the network and guest lecturers who are specifically trained by the CPN to conduct the course. It is based on the latest recommendations and best practices in the field as well as on the experience and expertise of the trainers. The course is designed for a minimum of 36 and a maximum of 45 participants composed of one (1) Municipal/Provincial/City Health Officer, one (1) Provincial/Municipal/City Social Welfare Development Officer and one (1) Women and Child Protection Desk Police Officer per municipality. The training course takes four days with eight hours per day. It can be run by a minimum of six persons, including the following: 1) physicians, 2) social workers, 3) lawyer and 4) secretariat.